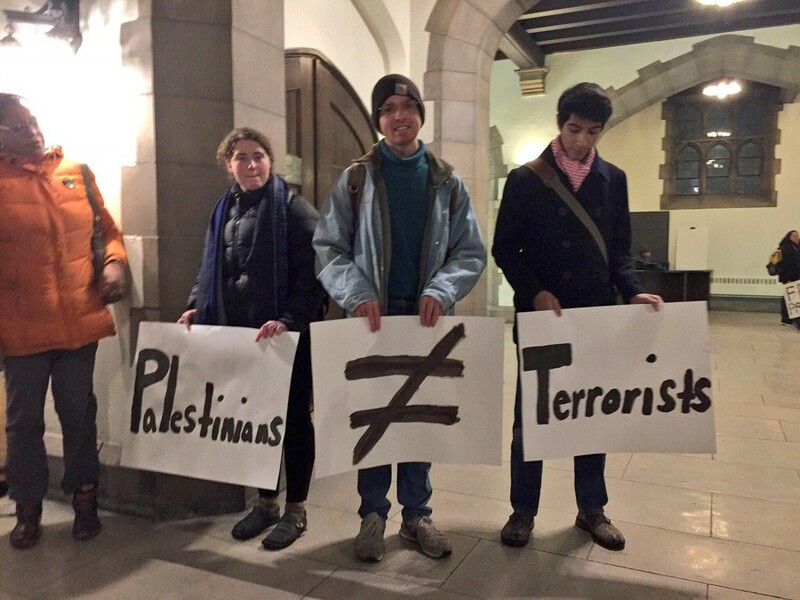 Students for Justice in Palestine organized a silent protest at Thursday's event, hosted by UChicago Alliance with Israel, Chabad Center, and Booth Armed Forces. Protesters from Students for Justice in Palestine hold up signs in Stuart. A discussion with two injured soldiers from the Israeli Defense Forces (IDF) drew over 20 silent protesters from Students for Justice in Palestine (SJP) and various other organizations on Thursday. The event, hosted by the UChicago Alliance with Israel, Chabad Center, and Booth Armed Forces, involved Staff Sergeants Amit Shachar and Matan Rottger. Shachar, a member of the elite special forces of the Paratrooper brigade, recounted a firefight which occurred after his unit was dispatched to gather intelligence and destroy tunnels from the Gaza Strip. Shachar’s unit was attacked by seven enemy combatants, resulting in a total of four IDF casualties, including one death. Shachar was injured by grenade shrapnel and multiple bullet wounds in his legs and back, and was hospitalized for four months. Rottger, a medic from the Kfir Duchfat infantry brigade, was severely injured along with two others soldiers after a car struck a guarded barricade near a Jewish settlement. Rottger suffered multiple broken bones and puncture wounds in his lungs, liver, and stomach. “Do not be ashamed of being Jewish,” he said. “Stand proud and tall, and do not let the lies take over. We totally respect them and only act in self-defense.” In response to protesters from the SJP, Rottger stated that “It would be hard for us to speak to [the protesters],” and that the demonstrations triggered flashbacks to his injury. Rottger stated that the vehicle accelerated towards the barricade where he was stationed. Shams said, “I would take what the soldiers said with a grain of salt.” He described the collision involving Rottger and the Palestinian driver of the van, Ahmed Shehadeh, in a recent Maroon op-ed, writing that Israeli soldiers constructed the barricade as a “surprise checkpoint near a sharp curve,” and that Rottger’s unit fired at Shehadeh’s vehicle immediately after the collision. Protesters from MEChA, UChicago Young Democratic Socialists of America (YDSA), and the UChicago chapter of the International Socialist Organization (ISO), joined SJP in support of the Palestinian cause, carrying various signs stating “Free Palestine,” “Shame on the IDF Oppressors,” “Were the 500 children you killed in Gaza terrorists too?” and “Colonizers get out of Palestine.” Demonstrations organized in front of the venue, and moved to a separate location towards the beginning of the discussion. This article has been updated to reflect the correct timeline of events in the collision between Rottger and Shehadeh. The Maroon regrets this error.